AUCKLAND (AUT University/Pacific Media Watch): A call for increased political and legal pressure on nuclear powers for "real justice" has been made by a Auckland University of Technology professor, Dr David Robie, who sailed on the Rainbow Warrior and has launched a new book about the bombing and the final voyage. Dr Robie’s book, a fresh edition of Eyes of Fire: The Last Voyage of the Rainbow Warrior, was launched at The Cloud on Queen’s Wharf on Friday 10 July. The book was published in tandem with an Eyes of Fire microsite community and public resource about the Rainbow Warrior by Little Island Press in partnership with AUT Bachelor of Communication Studies students, the AUT Pacific Media Centre, and Greenpeace. This year marks 30 years since the Rainbow Warrior bombing in New Zealand. The original Greenpeace vessel, used for campaigning against nuclear testing, was bombed twice in a matter of minutes and sunk by two French secret agents in the port of Auckland on 10 July 1985. Just three days prior to the bombing, Dr David Robie, an AUT professor and director of the Pacific Media Centre, spent 10 weeks on board the vessel as an independent journalist, the only New Zealand media person accompanying the anti-nuclear testing campaigners. Dr Robie says regional pressure had “relaxed” since the end of French nuclear tests at Moruroa Atoll in 1996. “Just ending the tests isn’t enough, it’s the unfinished business of the massive clean-up and health burden left by at least 269 nuclear tests in the region, many of them toxic atmospheric tests,” says Dr Robie. In his book, Dr Robie describes how the Marshall Islands took the bold step of filing unprecedented lawsuits against the nine global nuclear powers in the International Court of Justice in The Hague and the US Federal Court last year. “This move may roll out for years, but if all Pacific countries get behind this brave example and opened up other challenges it could raise the legal and political stakes,” says Dr Robie. The Marshall Islands government argued the nuclear powers were in violation of international law for failing to disarm. However, a US federal judge earlier this year dismissed the case on the grounds that the alleged breach of the Non-Proliferation of Nuclear Weapons Treaty (NPT) was speculative. “While this was discouraging, the Marshall Islands legal advisers planned an appeal and their International Court case may gain more traction,” said Dr Robie. While the Morin law in France had opened the door to greater compensation for the nuclear tests in Polynesia and there had been ten successful compensation cases awarded earlier this year, this legislation had been criticised as inadequate. “Moruroa and Fangataufa have yet to be 'cleaned up' and handed back to Tahiti,” says Dr Robie. However, Dr Robie added that the government of Fiji earlier this year had awarded compensation to 70 Fijian veterans who were deployed by the Britain to Kiritimati for the nuclear tests. Friday, 10 July 1985, marks 30 years since French intelligence agents blew up the Greenpeace vessel Rainbow Warrior in Auckland harbour, killing Portuguese photographer Fernando Pereira. It was an event which played a key role in focusing international attention on France's role in nuclear testing in the Pacific, and helped cement New Zealand's anti-nuclear stance. The boat was docked in Auckland on its way to Moruroa atoll in French Polynesia to protest the French nuclear weapons testing programme there. Journalism educator David Robie, an independent journalist on board the Rainbow Warrior at the time, recalls what happened vividly. He has also written the book Eyes of Fire about the voyage. AUT University Pacific Media Centre director David Robie talks to Newstalk ZB's Michael Sergel about the Rainbow Warrior's final voyage to the Marshall Islands, and the lasting legacy of nuclear testing and the bombing of the Rainbow Warrior 30 years on. The story of the bombing of the Rainbow Warrior has been told many times but it’s almost invariably from a New Zealand point of view – our response to a terrorist attack by French spies and the geo-political struggle that ensued. But the Rainbow Warrior story is also the story of the struggle of Pacific Island peoples against the nuclear testing programmes of not just France, but the US and Britain as well. 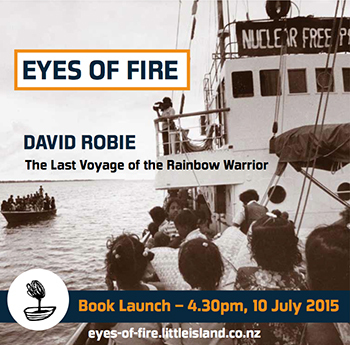 AUT professor of journalism David Robie has written extensively about the poisonous legacy of nuclear testing and is the author of Eyes of Fire – The Last Voyage of the Rainbow Warrior. Journalists Lise Charge and Amelie David provide a French perspective; and Gary Born, Greenpeace’s counsel in its arbitration with the French government, reflects on the lasting impact of the case on international dispute resolution. Less than two months before France bombed Greenpeace's Rainbow Warrior in Auckland Harbour in July 1985, the ship had made a dramatic voyage through the Pacific. 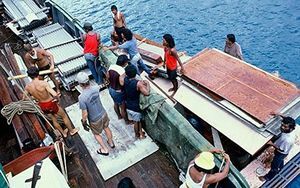 It was its first and last Pacific voyage and a remarkable one, relocating the people of Rongelap Atoll in the Marshall Islands. Rongelap had been caught in downwind fallout from the US Bravo Hydrogen Bomb test at Bikini Atoll 35 years earlier. The Rongelapese had been moved off the island for three years but taken back in 1957. But they continued to suffer an inordinate number of cancer conditions and other health problems attributed to the bomb test fallout. So plans were made to move them again and Greenpeace offered to help. One of those on the Rainbow Warrior at Rongelap - one of five journalists - was New Zealander David Robie, who these days is Professor Robie and director of the Pacific Media Centre at AUT. Professor Robie's account of these events is Eyes of Fire - The Last Voyage of the Rainbow Warrior, and that is being re-issued to mark the 30th anniversary of the sinking. In light of the 30th anniversary of the sinking of the Rainbow Warrior, George Freeman speaks to Pacific Media Centre director Professor David Robie about its legacy, and why the bombing is still an event that is remembered 30 years on.